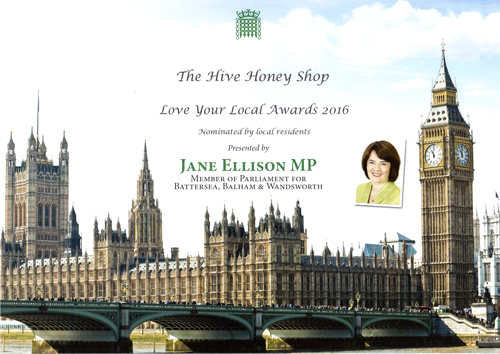 What a surprise we received when Jane Ellison MP for Battersea, Balham & Wandsworth arrived at our shop to present us with an award. We had no idea that local residents had been nominating us for the Love Your Local Award 2016. Thank you to all our loyal customers, residents and friends for voting! It’s great to know you like what we are doing here and appreciate all the work that goes into harvesting our honeys.